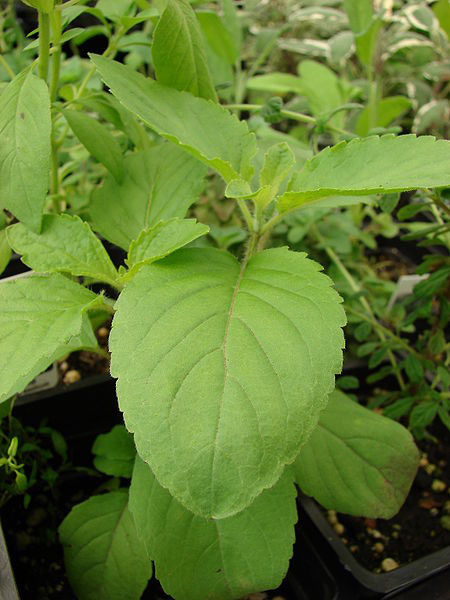 Holy basil (Kaphrao) has a distinctive scent of clove, and jagged tipped leaves. It is used, for instance, in the well-known Kaphrao moo (minced pork fried with basil). It is sometimes referred to as "Hairy Basil". It should not be confused with Horapha, which is normally known as Thai basil, or with Thai lemon basil. The three have very different flavors, and are required in certain dishes if you want to have it come out tasting just right. The leaves and stems of Holy Basil have very fine fuzzy hairs growing on them.